I just checked in with my son and asked him,"What was the best book you read when you were little?" "The ones with Uh Oh Duck." he quickly responded. So, if you have someone at home still loving picture books, you might want to give Duck for President, Giggle, Giggle, Quack or Click, Clack, Moo by Dorin Corwin a try. Because I was fishing for a middle readers (3rd-6th grade) chapter book, I dug a little further. "Those were great, but what about one of your first favorite chapter books. One you loved because it was fun to read." To this he responded, "Phantom Tollbooth, remember Tick and Tock." I sure do! I know them because my son read the story to me. He was in the second grade and still required to read his books aloud to me. He was still working on fluency and accuracy, so the best way to know how things were going was to listen to him read. He came early to reading and many of the more complex elements of humor were lost on him, but he loves it all the same. Here is why--it is a fantastically humorous story, he had great success reading it aloud and we did it together. 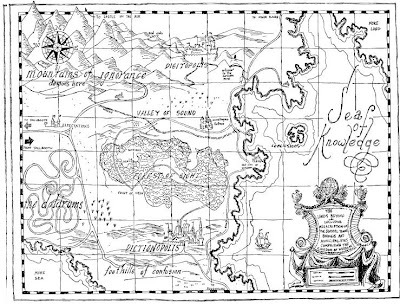 So pick up a copy of Phantom Tollbooth and share it with your kids. If they are capable of reading it to you, just lay back and enjoy the story. I will warn you, however, that you may be doing some catch up reading, as they may read even when you are not available to listen. Here are a few facts. 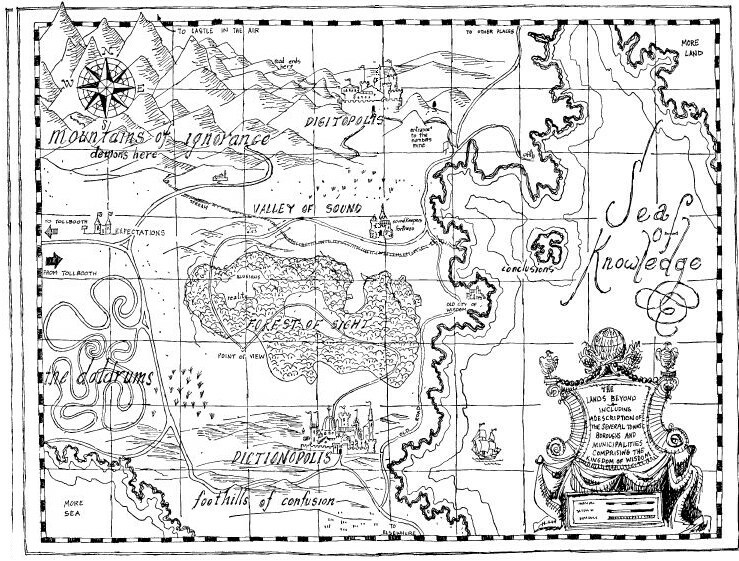 The book was published in 1961 and written by Norton Juster. It was made into a movie in 1970. The writing is full of puns that exemplify the literal meaning of many of our English language idioms. The story begins when Milo, a boy who is bored by everything, receives a mysterious package with a note that reads "FOR MILO,WHO HAS PLENTY OF TIME." Upon opening the package, Milo finds and builds a miniature tollbooth and a map of the Lands Beyond. With this, he gets behind the wheel of his miniature car and drives through what proves to be a magical tollbooth. On the other side of the booth, he finds himself on the "road to expectations." Paying no attention to his surroundings, Milo is soon lost in "the Duldrums," a colorless place where thinking and laughing are not allowed. Ultimately, he is rescued by the aforementioned Tock, a watchdog with an alarm clock attached to him. Together they move along this witty adventure and ultimately find themselves on a quest to rescue two princesses-Princess Rhyme and Princess Reason. If you love a back-story, you many want to pick up the annotated version published last fall. It includes interviews with the author and illustrator and illuminating excerpts from Juster's notes and drafts.